In our last blog posts related to Back to Basics Series we discussed about Virtual Machine Files (Part1), Standard Switches (Part2), vCenter Server (Part 3),Templates (Part4) vApp (Part 5), Migration (Part 6),Cloning (Part 7), Host Profiles (Part 8), Virtual Volumes AKA VVOL's (Part 9) Fault Tolerance (Part10) ,Distributed Switches (Part 11) and Distributed Resource Scheduler Part 12 and vCenter Server High Availability (Part 13) we also discussed about the various tasks related to building Home Lab Part1, Part 2, Part 3,Part 4 Part 5. 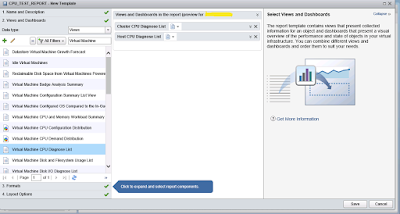 Dedicated this article to understand how to create CPU reports in VMware vRealize Operations Manager, but before we proceed further would recommend all to refer few articles which I have dedicated talking about VROPS like VMware vRealize Operations Manager -10 Things You Need to Know & vRealize Operations Manager 6.5 - What's New this will give you a quick overview about features/functionality and capabilities of VROPS. 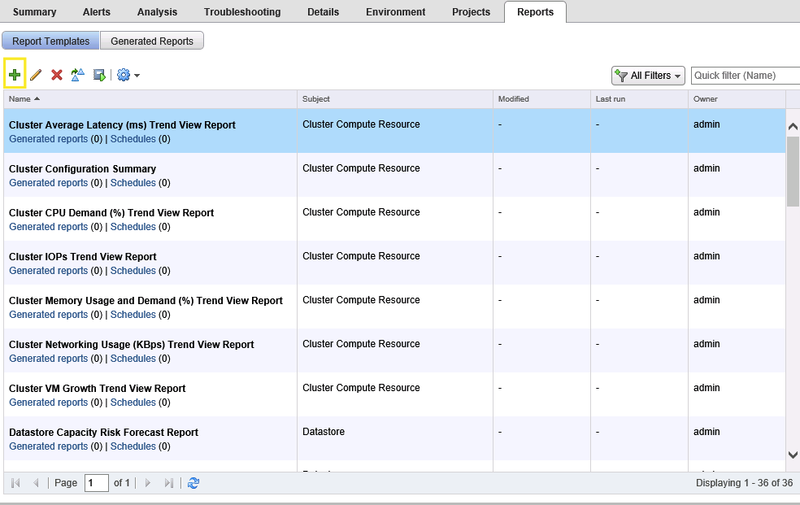 When creating a report in VMware vRealize Operations Manager we make use of report template which is a predefined container of one or more views, In this post I have decided to create CPU report for Cluster, so selected my cluster and under reports clicked the + Green Icon. 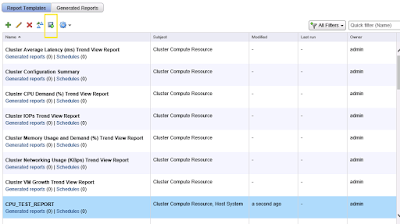 In Report template we need to provide the name and description, as this was a test Home Lab environment so I used CPU_TEST_REPORT as the name and description talks about CPU_TEST_REPORT For CLUSTER,HOST and VM. Next task in the list is to select Data Type - Views and Dashboards, select View and we can make use of quick filter to search for specific Views based on our requirements, I selected Cluster CPU Diagnose List, Host CPU Diagnose List and Virtual Machine Cpu Diagnose List, this can vary again based on your requirements if you are not too sure what option to select from the list use drag and drop menu provided to see what view fit's in your requirements. 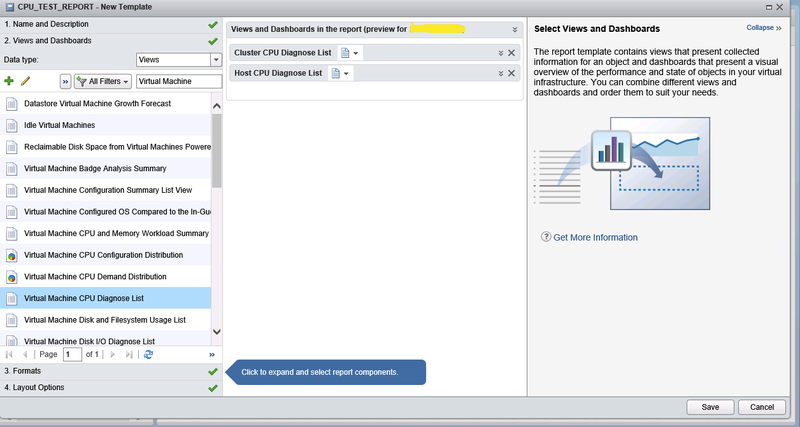 as mentioned above I only selected CPU as the options because I want to view the report for CPU. 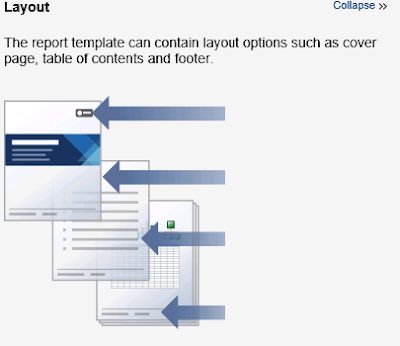 Next option in the list is Format option which gives us the option to create reports in CSV and PDF Version, we can select both or one of them, Layout option talks about footers,cover page, table of contents in the report. After saving the report template we can go ahead and run the template from the same screen from where we have created the template and check under generated reports tabs if the report has been generated successfully. 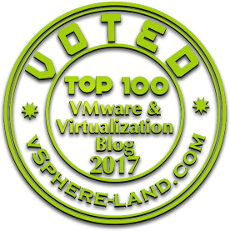 VMware vRealize operations manager is great product which helps us to monitor different environments, giving us the detailed information about Health, Risks and Efficiency, Anomalies, Faults,etc. 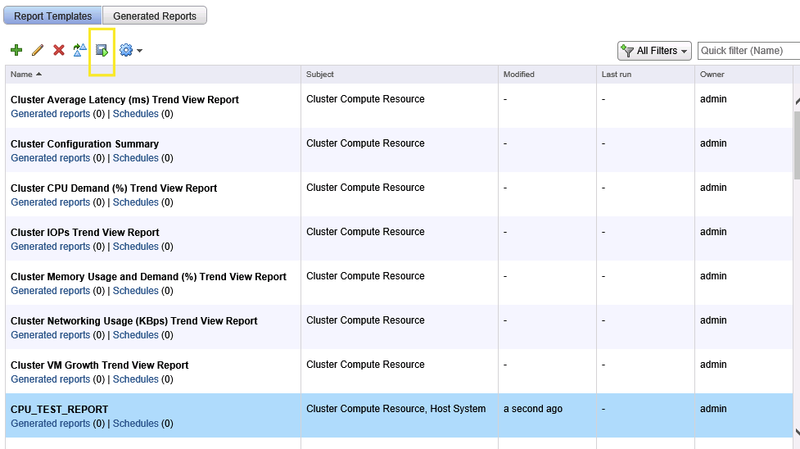 Fetching out reports in vROPS can help us to perform various activities within our production environment ,I remember one of the question being asked from my participants wherein they were looking for those ESXi host which are currently in not responding state and also those hosts which have SSH service running,vROPS can help us to fetch out these kinds of report to achieve a broaden level of security for our Production Environment. 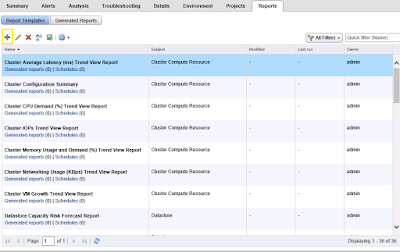 With VMware vRealize Operations Manager we can not only monitor the VMware vSphere environment but we can also add management packs for various other sources like (Management Pack for vRealize Log Insight , Management Pack for vSAN). Refer VMware Solutions Exchange for Complete List of Management Packs.